THAT network presents a collaborative exhibition between art students and art teachers from across the borough of Tower Hamlets celebrating the practice of drawing. Alongside the show will run a series of workshops and seminars inquiring into various drawing methods for analysing the empirical, led by: UAL Insights, ‘A’ Team Arts, Royal Drawing School, Bow Arts, Chisenhale Gallery, Whitechapel Gallery and Auto-Italia. With generous support from Tower Hamlets Arts and Music Education Service (THAMES), part of Tower Hamlets Council. Thank you to Great Art for their generous support. The exhibition is at the Art Pavilion, Mile End Park, Clinton Road, E3 4QY from the 27th February 2019 – 4th March 2019. THAT Network offered a residential CPD for Network teachers in November at Othona-Bradwell-on-Sea- to take part in a variety of innovative drawing workshops to inform their pedagogy, refresh their skills and revisit their creative practice. The work produced on this weekend will inform and develop further investigations into art practice and developed work will be exhibited alongside the artist students’ work at the Art Pavilion in February 2019. Celebrating the creative arts within our schools and sixth forms in Tower Hamlets is at the top of the agenda for THAT Network; a collective group of artist teachers. The message, creative arts are integral to our society and yes it is a viable career path; it generates £98 billions pounds – who knew? Amid cuts to the arts and it being marginalised when it comes to options in many a school curricula, what better way to showcase the talent of students via an exhibition at the Arts Pavilion, Mile End and inspire future generations. Ten participating schools within the Network selected students work who were studying either GCSE or A level art, graphic communication, photography or textiles alongside sketchbooks and prototypes. The work in the exhibition was ‘stunning and people need to see this’ as quoted by one Head Teacher, was one of many positive reactions heard throughout the week. The private view, held on Thursday 22nd February 2018, with the show being open to the public from Wednesday 21st – 25th February and was a huge success with so many positive comments about the work and the importance of showcasing and celebrating it within a community setting. The exhibition was supported by partners and art organisations within the borough and further afield such as the Whitechapel Gallery, Chisenhale Gallery, Auto Italia, Bow Arts, UAL – Central St Martins and their student ambassadors who led workshops alone side ‘A’ Team Arts and THAMES, whose invaluable support has been integral to us creating and collaborating as a funded network. Presentations from Whitechapel Art Gallery and from designer, Rahemur Rahman and artist, Ayo Akingbade (Chisenhale Gallery) who told their personal stories of how they followed their passions of being creative in school and pursued this to where they are now as designer/ lecturer and film maker was so inspiring to hear. So what’s next? Another show, build upon the success of the last one and create more of a stir, reach out, agitate and wake people up to the amazing talent in the borough and wonderful opportunities that are available. This event is intended to raise awareness and inform potential students, their parents and school leaders of the need to provide A Level Art subjects in our schools across the borough of Tower Hamlets. Due to the new EBacc performance measure for schools, Art subjects are being marginalised/withdrawn from the Post -16 curriculum in favour of core subjects. In response to this we wish to use this opportunity to showcase the best in Post-16 Art and encourage KS4 Art students to select an Art based A Level to study, at one of ‘THAT network’s’ participating schools. Showcasing Tower Hamlets’ 6th form artists. 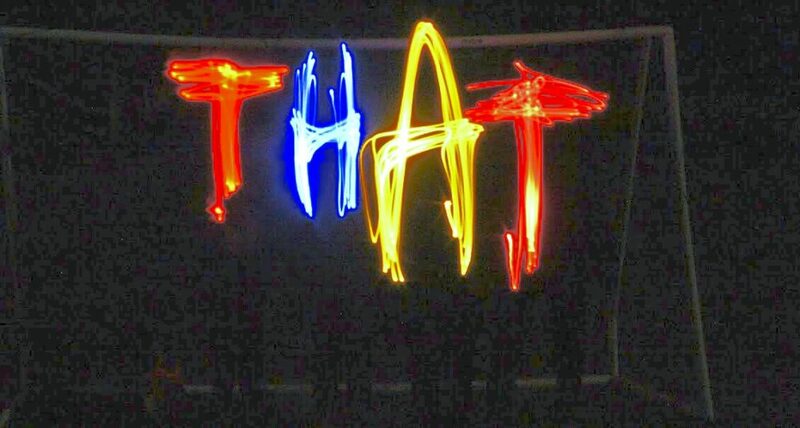 Generously supported by THAMES, ‘A’ Team Arts and Central Saint Martins UAL. The following arts organisations and galleries will be supporting the event on the night with information about how they support education. THAT Half is the new exhibition showcasing work from Tower Hamlets Artist Teachers Network at The Half Moon Theatre, 43 White Horse Road, E1 0ND. Please come and join us for the Private View on Thursday 4th May from 6-8.30pm. The photographer David George (co-founder of the art collective ‘Uncertain States’) led a very enjoyable and successful cyanotype workshop at SPWT. Cyanotype is an early archival process used by the first acknowledged female photographer: Anna Atkins in 1843. It requires just two chemicals, a good negative, tap water and the sun’s solar rays to achieve outstanding results. The process can also be used for photograms (without the need of a darkroom). 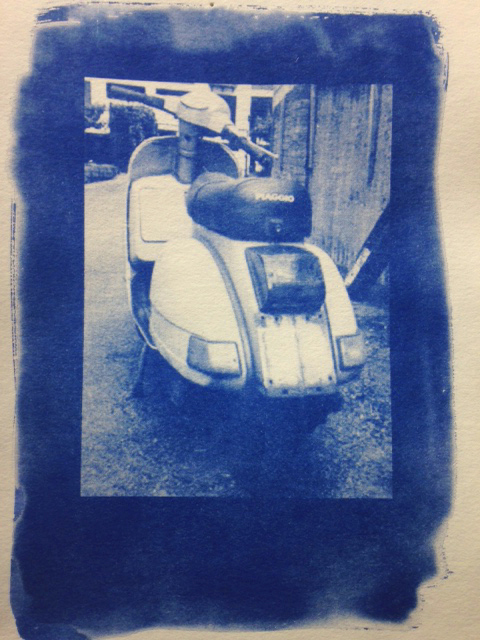 The cyanotype can be produced on most paper and even some fabrics. The image can derive from a digital or analogue negative and the result is striking in its rich Prussian Blues. If you are interested in developing your skills base in alternative processes The Cass (opposite Whitechapel Gallery) run some excellent courses. For a step-by-step guide to alternative printing processes this book is well worth the investment: ‘Coming into Focus’ edited by John Barnier and published by Chronicle books. ‘Uncertain States’ is an artist led project made up of writers, art practitioners and academics that share the same creative values and publish a quarterly broadsheet, showcasing lens-based art. Our second workshop this spring was with artist Paul Wye, who specialises in printmaking and textiles. Paul shared with us monoprinting techniques (additive and subtractive) as well as paper lithography technique using photocopied image. Paul’s presentation and a selection of images can be found here.